The S.G.C. is desperately searching for ample quantities naquadah sufficient to build ships to defend Earth in an expansion of the X-303 program. A team of engineers and miners on P3X-403, under the command of Colonel Edwards, think they’ve found a large deposit deep underground. Unfortunately, the region is inhabited by the simple and primitive Unas. When one of the engineers is abducted, SG-1 comes to lend a hand. Dr. Daniel Jackson notices artifacts carelessly piled on the ground, and is incensed with the fact that movement of the objects could spell trouble. From among the artifacts, Daniel spies a yoke designed to fit a large creature. He tells Colonel Jack O’Neill there may be Unas in the area. Using Teal’c’s finely honed tracking skills over rough terrain; they set off to find the missing airman. He is dead, stuck on a pole — like a scarecrow — to warn off intruders. Among the warnings are old Jaffa armor, manacles, pain sticks, and staff weapons arranged to make it plain what will happen to intruders. The two units join forces to drive off the Unas. In the ambush that follows, O’Neill is injured so badly he must return to base. The troops withdraw en masse to the S.G.C. While they are gone, the Unas trash the encampment. At Stargate Command, Daniel must convince the military that the mining activities somehow provoked the attack and that the best option is negotiations. Colonel Edwards is irritated at the suggestion. He thinks Unas are only animals. Daniel makes his case to General Hammond and General Vidrine. He is told he can try negotiating with the creatures, but bottom line, the need for the naquadah outweighs the needs of the Unas. Daniel is on the clock, so he sends for his old Unas friend, Chaka. Chaka agrees to help and goes with Daniel to mediate. In ritualistic greetings, Daniel tries to make the Unas leader, “Iron Shirt” (because he wears a chain mail shirt) understand that the humans just want the naquadah — not the land, per se. He explains it will be used to defeat a common enemy. From the exchange, the Unas explain their anger over the fact that the mine is on sacred ground. Back at the camp to report, Daniel is told the miners confirmed a massive vein of naquadah in the area. Now there is no option but to mine it. Generals Hammond and Vidrine give Daniel 24 hours to make a deal. Otherwise, the Air Force will go in with tranquilizers to forcibly relocate the Unas. Daniel and Chaka return to the campfire to meet again with Iron Shirt. The Unas refuse to give the right to mine the naquadah. Daniel warns him that the humans will kill the Unas and prevail, but Iron Shirt tells him his Unas are so numerous the humans will lose. Daniel realizes there are many thousands, organized in a tribal community. Meanwhile, the SG troops are patrolling the perimeter when a lone Unas returns to the scene of the first battle to retrieve his necklace. Caught by surprise, an airman opens fire, killing the creature. The other Unas become enraged and march on the S.G.C. encampment. Edwards thinks that superior firepower will scare them off. Daniel and Teal’c try to reason with him that the Unas are there in the tens of thousands. The only reason they weren’t detected before is because they live in underground caves where a U.A.V. would not detect them. Suddenly, the ridge above the camp is filled with hundreds of angry Unas, roaring their battle cry at the humans. Iron Shirt displays his authority with a wail that quiets the others. Then he alone walks confidently into the human camp to accept the S.G. teams’ surrender. Edwards is vehemently against the notion that he would surrender to a throng of primitive animals, but Chaka leads the way by kneeling to show submission. Daniel urges the Colonel to get everyone down on the ground to show the humans are not a threat and wish for peace. The alternative is being mowed down by all the Unas gathered above. Edwards relents. After a moment of gloating, Iron Shirt accepts. To restart the negotiations, Daniel pulls out his lighter and shows how it can set fire to a twig. Iron Shirt is intrigued and settles down to negotiate once more by offering his bone necklace. Eventually, a peaceful solution is reached. To honor their ancestors, the Unas themselves will mine the naquadah and turn the material over to Stargate Command. “Enemy Mine” was the original working title for this episode, thought the title “Hallowed Ground” was strongly considered. In the end, the original was kept. “This is actually another story that Peter wanted to do last year, but it didn’t make sense to do it because it involves the Unas, specifically Chaka. We just felt it didn’t make sense to do an Unas or Chaka story without the Daniel character. Once again, with Daniel back, we dusted off the pitch and Peter wrote it. The S.G.C., or members of the military, are looking for an off-world naquadah mine. They think they found one, and it’s while they’re basically searching this mine area that one of their members is attacked. SG-1 comes to check out what’s happened, and of course it turns out to be the Unas. In order to deal with the threat, Daniel suggests they use Chaka as an intermediary. VOTE! 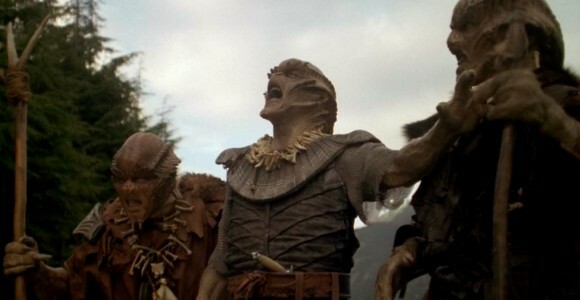 How would you rate SG-1's "Enemy Mine?"